Ever wondered how the elves move their goods around the Christmas Village? Why they call on elves Zippy McParcel and Sugarplum SpeedyPud of course! Zippy and Sugarplum dash around the village in their festive vans delivering parcels and puddings to all the residents of the Christmas Village. The vans have been designed with a flat bottom they can sit on a mantle piece as part of a winter village scene. 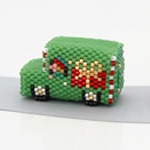 Made using Round Peyote and Odd Count Peyote each van takes around 3 hours to bead. As usual with ThreadABead featured patterns we give full detailed photographic instructions and in this pattern there are 41 detailed steps, making this pattern even suitable for beginners to beading. Please note the pattern may not work with any other size and type of beads. There are 13 colours in total and the finished beadwork is approximately 3.5cm (w) x 1.75cm (d) x 2cm (h) A small amount of wadding is also required. The bead pattern supplied is 14 pages and includes full colour photo instructions and a coloured pattern chart where needed.